WILDWOOD CREST – The Borough of Wildwood Crest will be celebrating the week of the Independence Day holiday in a big way. 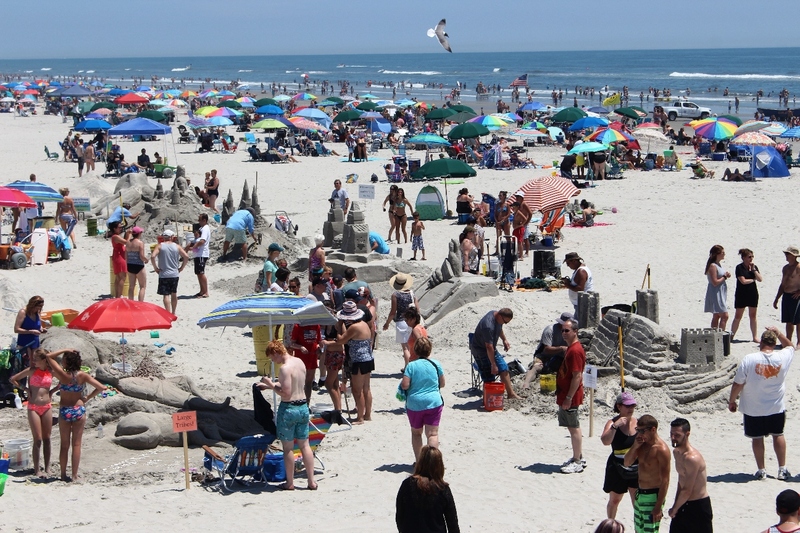 The Crest will host three live music shows and its sixth annual Sand Sculpting Festival over the span of four days from Wednesday, July 4, through Saturday, July 7. The festivities begin the evening of Wednesday, July 4, with a live music performance by Roundhouse Band, as part of the Wildwood Crest Summer Music Series. The show will be held at Centennial Park at Fern Road and Ocean Avenue at 7:30 PM. Roundhouse is a party band with full horn and rhythm sections that performs pop, dance and oldies hits. The spectacular Wildwoods’ Fourth of July fireworks display will be visible from the east side of the park following the music show at 10 PM. On Friday, July 6, the Chatterband will perform at Centennial Park at 7:30 PM. The band was originally scheduled to play on May 27 at the Wildwood Crest Summer Kickoff Concert but the event was postponed by rain. The Chatterband bills its style as “Old Skool to New Kool” and covers a wide variety of pop, rock and dance hits from the 1960s through today. The Chatterband is one of the Delaware Valley’s longest-running and most popular acts. Saturday, July 7, will feature two events in Wildwood Crest. The sixth annual Wildwood Crest Sand Sculpting Festival will take place from 9 AM to 2 PM on the beach in the shadows of the Wildwood Crest Beach Pier at Heather Road. The event includes an amateur sand sculpting contest with prizes to the winners, live music with Mike and Callie at 10 AM and Twelve:01 at noon, sandwiched around the popular Hocus Pocus It’s Joe Fischer Magic Show at 11:30 AM. Registration for the sand sculpting contest is free and attendance at the event is also free for spectators. Also on Saturday, July 7, the Wildwood Crest Summer Music Series continues with a performance by Parrotbeach, a Jimmy Buffett tribute band, at Centennial Park at 7:30 PM. Parrotbeach, led by entertaining lead singer Remy St. Martin, is one of the top Jimmy Buffett tribute bands in the country. For further information about the July 4 week events and all special events in Wildwood Crest, log on to wildwoodcrest.org or call 609-523-0202 or 609-522-0221.